The biggest under-the-hood change for the Ryzen 2000-series processors is in the cache latency. AMD is claiming that they were able to knock one-cycle from L1 and L2 caches, several cycles from L3, and better DRAM performance. Because pure core IPC is intimately intertwined with the caches (the size, the latency, the bandwidth), these new numbers are leading AMD to claim that these new processors can offer a +3% IPC gain over the previous generation. It is interesting that in the official slide deck AMD quotes latency measured as time, although in private conversations in our briefing it was discussed in terms of clock cycles. Ultimately latency measured as time can take advantage of other internal enhancements; however a pure engineer prefers to discuss clock cycles. Naturally we went ahead to test the two aspects of this equation: are the cache metrics actually lower, and do we get an IPC uplift? Cache Me Ousside, How Bow Dah? The most obvious comparison is between the AMD processors. Here we have the Ryzen 7 1800X from the initial launch, the Ryzen 5 2400G APU that pairs Zen cores with Vega graphics, and the new Ryzen 7 2700X processor. This graph is logarithmic in both axes. 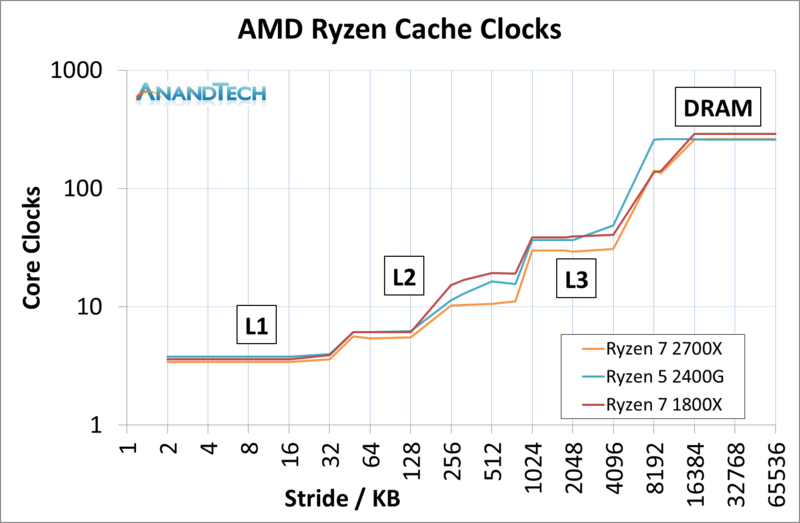 This graph shows that in every phase of the cache design, the newest Ryzen 7 2700X requires fewer core clocks. 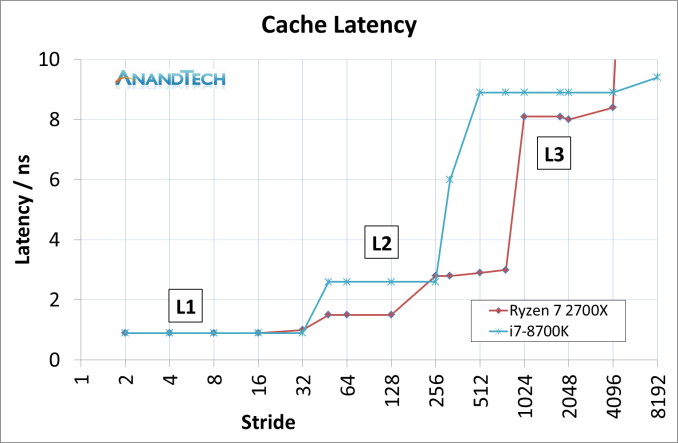 The biggest difference is on the L2 cache latency, but L3 has a sizeable gain as well. The reason that the L2 gain is so large, especially between the 1800X and 2700X, is an interesting story. When AMD first launched the Ryzen 7 1800X, the L2 latency was tested and listed at 17 clocks. This was a little high – it turns out that the engineers had intended for the L2 latency to be 12 clocks initially, but run out of time to tune the firmware and layout before sending the design off to be manufactured, leaving 17 cycles as the best compromise based on what the design was capable of and did not cause issues. 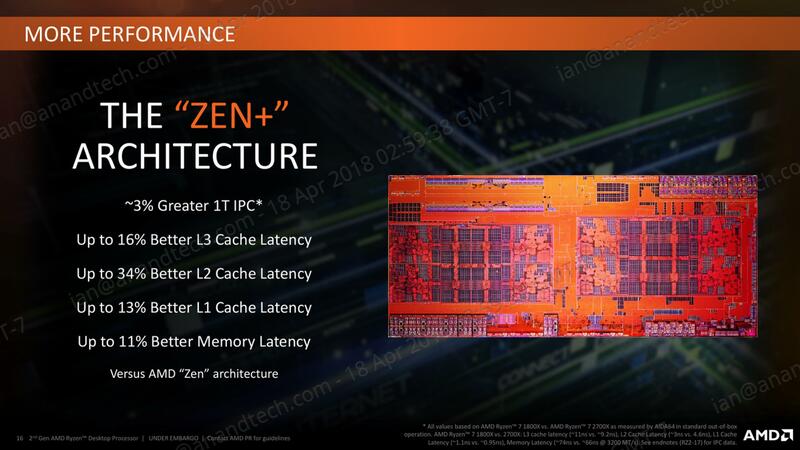 With Threadripper and the Ryzen APUs, AMD tweaked the design enough to hit an L2 latency of 12 cycles, which was not specifically promoted at the time despite the benefits it provides. Now with the Ryzen 2000-series, AMD has reduced it down further to 11 cycles. We were told that this was due to both the new manufacturing process but also additional tweaks made to ensure signal coherency. In our testing, we actually saw an average L2 latency of 10.4 cycles, down from 16.9 cycles in on the Ryzen 7 1800X. The L3 difference is a little unexpected: AMD stated a 16% better latency: 11.0 ns to 9.2 ns. We saw a change from 10.7 ns to 8.1 ns, which was a drop from 39 cycles to 30 cycles. AMD has a larger L2 cache, however the AMD L3 cache is a non-inclusive victim cache, which means it cannot be pre-fetched into unlike the Intel L3 cache. 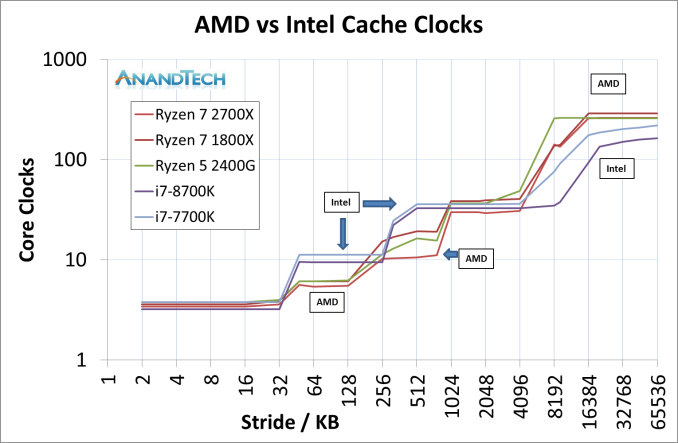 This was an unexpected result, but we can see clearly that AMD has a latency timing advantage across the L2 and L3 caches. There is a sizable difference in DRAM, however the core performance metrics are here in the lower caches. We can expand this out to include the three AMD chips, as well as Intel’s Coffee Lake and Kaby Lake cores. This is a graph using cycles rather than timing latency: Intel has a small L1 advantage, however the larger L2 caches in AMD’s Zen designs mean that Intel has to hit the higher latency L3 earlier. Intel makes quick work of DRAM cycle latency however.